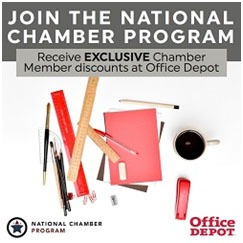 Our partnership with the National Chamber Program brings cost savings for you, our members! Save on what you need to do business, while supporting your chamber. Members save up to 55% on 500+ items that chamber members purchase most often, including special discounts on ink and toner. Members get deep discounts on Copy & Print services. 2.5₵ black & white, 22₵ color copies and 40% off finishing services every day! Sign up online to start saving! There is no cost to join. *If you do not know your portal account link, please contact your Affiliate Specialist.